The southeast is made up of the counties of Hampshire, Sussex, Surrey, Kent, Berkshire, Middlesex, London, Oxfordshire, Buckinghamshire, Hertfordshire, Bedfordshire and Essex. 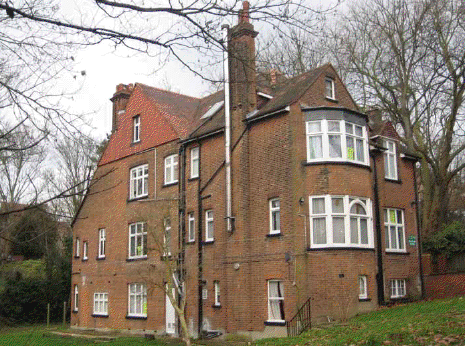 There is a Heysham Lane in Branch Hill, Hampstead NW3 in London. Branch Hill, which is northwest of Regents Park, consists of several individual blocks of woodland, interposed with small areas of grassland. It also incorporates the private grounds of three large houses: Combe Lodge, Oak Hill House and Heysham House, below. The latter is probably named for Heysham Lane, vice the family. There is a Heysham Road in South Tottenham N15, in London. This is due north of London. 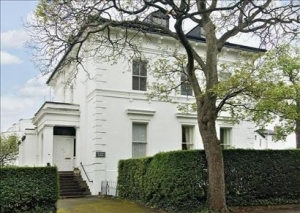 There is a Heysham House at 52 Park Place, in Cheltenham, Gloucester. It "is a handsome Victorian villa built c1859." right. The following was a donation (bribe?) from the Cooper's Company, the guild of the barrel makers, to the Lord Mayor of London. This was a very early use of the Heysham spelling, though not the earliest. The mayor's clerk, while it might sound like a minor job to modern ears, was probably a sought-after position combining both good pay and security, and requiring connections to obtain. The Lord Mayor of London in 1575 was Ambrose Nicholas, salter. He had been a Sheriff of the city in 1566-7. He was knighted at Whitehall during his mayoralty. Note that a Thomas Heysham of the city of London, but born in Staffordshire, probably a merchant, had his will proved in 1565. Might our "Mr. Heysham" be a relative of Thomas? The Lord Mayor is elected on the 29th of September each year from among those aldermen who have served the office of sheriff. The household staff of the Lord Mayor of London held their offices by purchase. At the head of them were the four esquires of the Lord Mayor, of whom the Swordbearer was the senior. Among the rank and file were the Lord Mayor's Clerk, the Common Crier, the Common Hunt, three Serjeant Carvers, three Serjeants of the Chamber, the Serjeant of the Channel, the two Marshalls, the four Attorney's of the Mayor's Court, the Water Bailiff, and several others. This was not the same as the Town Clerk of London, which was an elective office. The Town Clerk took the minutes of Council meeting, and was also a legal advisor and recorder of city law. He worked out of the Guildhall. The Town Clerk in 1575 was William Sebright. Of Bethnal Green, which is in London's East End. He was apparently a merchant or tradesman and would make a good son for Mr. Heysham, above. Bread Street was in or near Cheapside. Yes, this was the poet Milton's father we're talking about. A laborer, of Stanwell, Middlesex. Stanwell is just south of today's Heathrow airport, between London and Windsor. 1633. "5 October, 8 Charles I.--True Bill that, whereas at Stanwell co. Midd. on the said day, Thomas Heysem alias Delbridge, William Butcher and William Wood, all three of Stanwell aforesaid labourers, stole nyne and a halfe yardes of damaske worth ninety shillings, together with other things set forth in the indictment, of the goods and chattels of Thomas Ayer gentleman, Hugh Strideup late of Oldebrainford co. Midd. yoman and his wife Alice Strideup and Thomas Bevin late of Hownsloe taylor on the next day, viz. 6th Oct., knowing him to have perpetrated the said felony received haboured and comforted the said Thomas Heysem. G.D.R., 20 Feb., 8 Charles I." - from "Middlesex County Records"
She married Richard Carter on 16 February 1594 at Saint Helen Bishopsgate, London, England. The church, located on Bishopsgate road just inside the wall, dates from 1210. A ward in the east part of the City of London, extending north from Gracechurch Street to Norton Folgate. It is named after one of the original seven gates in London Wall. Moorgate was just to the west and Aldgate lay next to the east. Originally Roman, the gate was rebuilt by the Hansa merchants in 1471. Its final form was built in 1735 by the City authorities and demolished in 1760. The Wall divided the the ward into an intramural portion called Bishopsgate Within and an extramural portion called Bishopsgate Without. Of St. Botolph, Aldersgate [an alternative spelling], London. A Woolman [that is, he probably traded in wool] and bachelor, about 26 years old, he married Anne Thomas, of St. Botolph, a widow, about 40 years old, on 9 February 1660 at Saint Gregory by Saint Paul, London. While originally dating back to circa 1000, the church was rebuilt in 1791. - from "Allegations for Marriage Licences Issued by the Vicar-Genera' of the Archbishop of Canterbury" in "Publications of the Harleian Society." (18) Elizabeth Hisham, who was christened on 31 August 1621 at St Bride Fleet St., London, England. (18) Marye Hisam, who was christened on 4 August 1622 at St Bride Fleet St., London, England. Perhaps a son of the above. He married Mary Layfield on 3 August 1662 at Saint Bride Fleet St., London, England. The following were brother, both of Black Friars. "St Ann Blackfriars was a London church of the seventeenth century, situated in the ward of Farringdon Within in Church Entry, Carter Lane. It was near the Blackfriars Theatre, a fact which displeased its congregation. It was destroyed in the Great Fire of London of 1666." Brother of John. We know, from his brother's will, that he was living in December 1705. In the 1709 and 1710 Land Tax Records of "The Upper Precinct of St. Bennetts Gracechurch," Bridge Ward, London as Thomas Heysham, Stock= "=1"4"= and rent of ".. .. .."
A small ward in London so called for its propinquity to London Bridge. This church was destroyed in the Great Fire of 1666 and rebuilt of Christopher Wren. 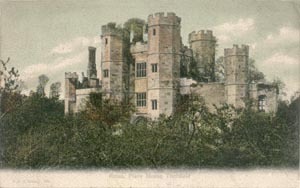 It was demolished in 1868. I give devise and bequeth unto my Loving Brother - Thomas Heysham the sume of one shilling and noe more. Item I give devise and bequeth unto my Loving Sisters Roberta, Eva and Anne to each of them the like sum of one Shilling and noe more. And my will is that the said respective Shillings soo given and bequethed to my said Brother and Sisters respectively shall be in full [garbled] to them and each and every of them from Paying them [garbled] or any part of my estate. Item the rest and residue of my Estate Whatsoever whither real or personal [garbled] kind or quality the same place be which I shall be possessed of or in any wise [garbled] I give devise and bequeth the same and every part thereto to my Loving wife Dorothy Heysham and to her only proper use and benefit. And I doe hereby make [garbled] and approve my said Loving Wife full and sole Executrix of this my last Will and Testament. And Lastly I doe hereby revoke and make void all other wills whatsoever by me at any time heretofore made or spoken. In Witness whereof I have hereunto [garbled] my hand and seal this Fourth Day of December Anno Dui 1705 And [garbled] Fourth yeare of the reigne of Queen Anne over England." The document was signed, "John Heysham, his Mark," that is, he was illiterate. Just north of the parish of St. Bride's, Fleet Street. Part of the parish is within the wall, but most is located just north of the City. The church is on Holburn Hill, between St. Andrew street and Shoe lane, and may date from as early as 971, as mentioned in a charter of King Edgar of Wessex. No member of the family, however, was in the list of tythe paying Parishoners of 1638. George Wicliffe and Elizab. Haesham [were they married?] had a child together. (18) John Haesham, who was christened on 14 March 1616 at St. Andrews, Holborn, London, England. (18) John Hisam, who was christened on 3 February 1618 at St. Andrews, Holborn, London, England. He died on 6 February 1618. (19) Mary Hesam, who was born on 25 March 1664 and christened on 3 April 1664 at St. Andrews, Holborn, London, England. Though I have no further records of the family, a member lived in Holburn, on Shoe Lane, in the early 19th century. "Winch & Heesom, carpenters, joiners, press makers, & undertakers, 54, Shoe-lane, Holborn, 1s." - from the "London Directory of Professions and Trades" 1811. He married Ann Cooke on 24 November 1674 at Saint Margaret, Westminster, London, England. (20) James Heysem, who was christened on 20 April 1679 in Saint Paul Covent Garden, Westminster, London, England. This was well to the west of the previous parishes. (20) William Hissom, who was born on 12 September 1681. He was christened on 25 September 1681 in Saint Martin in The Fields, Westminster, London, England. Thomas was somebody, a lawyer if not a knob, but of what part of the family? 9 June 1771. Marriages. "Tho. Heysham, Esq. 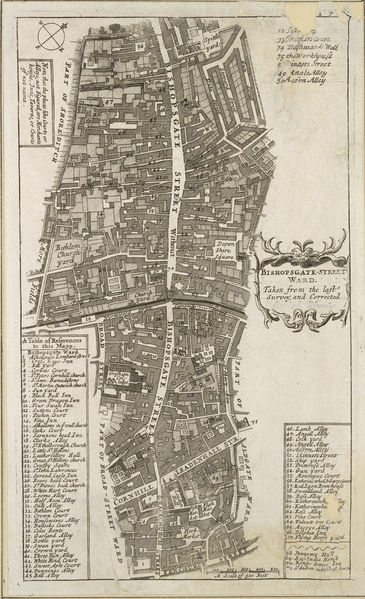 ; New Bond-Street--to Miss Page, of Queen-Anne-Street." - from the "Gentleman's Magazine"
Bond street is a major shopping street that runs through Mayfair from Piccadilly to Oxford Street, in the north. The southern section is known as Old Bond Street while the northern is the New Bond Street. Both Queen Anne street and Oxford street are in the fashionable Marylebone district. A book published in London in 1786, "An Essay Intended to Establish a Standard for an Universal System of Stenography" by Samuel Taylor, was subscribed by a Mr. Thomas Heysham. Other subscribers included, beside the usual raft of Lords, a large number of attorney's. Was this a Thornton-Heysham or a son/grandson of John Heysham of Lancaster? Some researchers list James as the son of Dr. John Heysham of Carlisle, but I disagree. James Heysham married Elizabeth Dobney on 26 April 1816 at Christ Church Greyfriars Newgate, London. 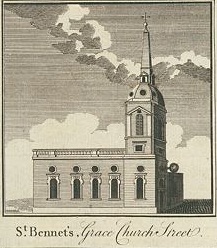 "James Heysham of this Parish Bachelor & Elizabeth Dobney of the Same Parish Spinster were married in this Church by Banns the Twenty Sixth Day of April in the Year One Thousand Eight Hundred and Sixteen" - from "London, England, Marriage and Banns, 1754-1921"
This couple had a child, Elizabeth, who was baptized on 8 September 1816 [5 months after her parents wedding]. James Heysham's occupation was given as Cooper. Could an officer in the Royal Navy, as was the son of Dr. John Heysham, be confused with a barrel maker? James' daughter, Elizabeth, married Daniel Drury on 3 November 1833 in St. Giles, Camberwell, Southwark, Surrey. It's fairly clear this was Elizabeth Dobney's daughter because one of the witnesses was Mary Ann Dobney, perhaps her aunt. Elizabeth Heysham, the daughter of James and Elizabeth, was christened on 8 September 1816 at St. Marys, Lambeth, in Surrey. Elizabeth Heysham married Daniel Drury on 3 November 1833 at St. Giles, Camberwell, Surrey. Their daughter, Lucy Susannah, was born on 22 December 1833 and christened on 22 January 1834 at St Mary, Newington, Surrey. Sounds like Elizabeth and Daniel had a last minute wedding. This was the region south of the river, generally a rougher neighborhood. Imprimis I commend my Soul to God Almighty and my Body to the Dust in hopes of a share in the glorious Resurrection at the appointed time of my Dread Lord and Maker and Do further will that it be interred according to the Direction of my Executors hereafter mentioned. I also do hereby constitute and appoint this my Said loving Daughter Martha Heysham my whole and sole Executrix of this my last Will and Testament whereunto I set my hand and seal this seventeenth day of June in the fourteenth year of our Sovreign Lord King Goerge and in the year of our Lord One thousand seven hundred and forty. The Mark of Mary Heysham. Signed and delivered in the presense of us who are Witnesses Philip Lathorpe, Peter Bryant, Thomas Jeynes. This Will was proved at London on the seventeenth day of October in the year of our Lord One thousand seven hundrend and forty three . . . By the oath of Martha Heysham Spinster the Daughter of the Deceased and sole Extrix named in the said Will whom administration was granted of all and singular the good Chattels and Credits of the said Deceased . . . "
He was the son of William and Mary Heesum. He was born on 12 December 1701. He was christened on 28 December 1701 at Saint Olave, Southwark, Surrey, England. He must have died before 1740 because he is not mentioned in his mother's will of that year. An Edward Heesom of London was a violin maker in 1748-50. He made mostly copies of Stainer - from "The Violin: Its Famous Makers and Their Imitators" by George Hart. It has been said that "The bright and easily-produced tones yielded by the Stainer model, soon made it popular in England, and the London makers vied with each other in reproducing it." - from "A Dictionary of Music and Musicians: (A.D. 1450-1880)" by John Alexander Fuller-Maitland, George Grove. A least one Edward Heesom violin is in use today by Benedict Cruft, Dean of the School of Music at the Hong Kong Academy for Performing Arts as of 2003. 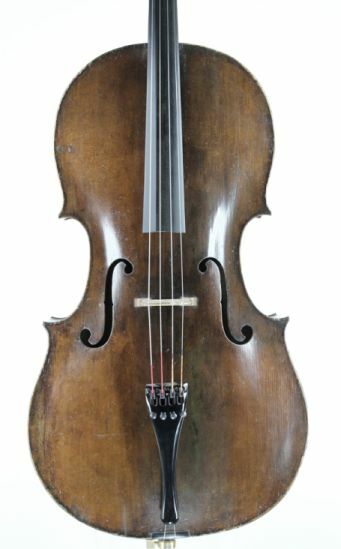 This violin belonged to Benedict's great-grandfather John Cruft, who, as a viola player, was one of the founding members of the London Symphony Orchestra. An Edward Heesom cello is pictured to the right. She survived her mother, Mary. His mother was Mary Heysham of Southwark, St Saviour's Parish, in London. I suspect he was born a Heesum, like Edward above, but under the influence of the fame of Robert and William Heysham, his surname was changed to match the "new fashion"
John Heysham married Anne Loadman on 25 April 1724 at Eton, Buckinghamshire, England. On 12 January 1725 their son, John Jr., was christened at Eton, but by 24 February he had died. The following certainly does not fit here, but I leave it as evidence of the issue of Heyman vs Heysham. A John Heysham was selected for a court position in the 1720's. "1724 - (London) Newnham Mr. However, according to "British History Online," under the listing "Sergeants at Arms at Court 1660�1837," this was J.A. Heyman. "The Database of Court Officers," at Loyola University at Chicago, shows this to have been John Andrew Heyman. So, nevermind. Our John was a plumber, ". . . John Heysham, Plumber in Eton, near Windsor, make and sells Leaden Pipes of all sizes . . ." - from "Lectures on the Science and Art of Sanitary Plumbing" by Samuel Stevens Hellyer. It is agreed and ordered that John Hoysham, plumber, be made free of this Corporation on payment of 6 guineas for a fine and he is now made free and sworn accordingly and paid his fine to Mr. Chamberlain Ason." - from "The Second Hall Book of the Borough of New Windsor, 1726-1783" by Windsor (Berkshire, England). This was probably a fee paid as part of being declared a free man, that is voting citizen, of the town. Windsor is quite near Eton. While a yeoman, John Heysham was still a respectable citizen. He served as a tithingman in 1731/2. A tithingman was a peace officer or under constable. He was a parish officer elected annually to preserve good order in the church, to make complaint of any disorderly conduct, and to enforce the observance of the Sabbath. Petty constables and tithingmen sworn. Eaton ... John Lunn and James Mitchell vice Francis Bending and Henry Stragnell. John Heysham and William Cranwell, tithingmen, vice Michael Bernard and Thomas Pritty. Daniel Beaumont of Eaton, starch-marker, L40 for not prosecuting his traverse, L20 for failing to answer to James Major, and L10 for failing to answer to John Heysham for assault. William Cramwell of Eaton, yeoman, surety for Daniel Beaumont to appear, L10. Daniel Beaumont's assault was on James Major at the Easter Sessions 1731. A John Heysham was as the victim of a theft. The trial was held at the Old Bailey on 20 April 1737. The defendent was John Johnson, also known as John Hamilton. "John Johnson, otherwise Hamilton, was indicted for stealing two Pewter Plates, value 2 s. the Goods of John Heysham, in the Parish of St. Dunstan in the West. March 23. Aquitted." Signed Sealed published and declared by the Testator John Heysham as and for his last Will and Testament in the presence of us who have Subscribed our hands at his request as Witnesses hereunto. "This Will was proved at London the twelfth day of February in the year of Our Lord One thousand Seven hundred and thirty nine before the Worshipful William Stahan Doctor of Laws Surrogate of the Right Worshipfull John Bettesworth Doctor of Laws Master Keeper or Commissary of the Prerogative Court of Canterbury lawfully constituted By the oath of Ann Heysham the Widow Relict and Sole Executrix named in the said Will to whom Adminstration was granted of all and Singular the Goods Chattells and Creditts of the said deceased being Sworn duly to administer." Eton is situated on the north bank of the Thames, and is connected with Windsor by a bridge across that river. It is in the extreme south of Buckinghamshire, which lies due west of Middlesex (Greater London) and Hertfordshire. South is Surrey and Berkshire, West is Oxforshire, and north lies Northamptonshire. John, the son of John Heysham, was baptized on 12 January 1725 in Eton, Buckinghamshire. He died on 24 February 1725. John Heysham married Elizabeth Pink at St. Saviours's, Southwark on 30 August 1752 - from the Register of Marriages at St. George's Chapel, Mayfair. This is not the John Heysham of Eton, above. He died in 1740 and no children are mentioned in his will. He's also not a son, since he wasn't mentioned in the other John's will. Perhaps a cousin. A John Heysham married Mary Pugh on 12 May 1765 at St. Saviours's, Southwark - from the IGI. There was clearly a large Heysham family in Southwark from about 1700 to the early 1800's. Richard married Elizabeth Spinks on 13 February 1763 at St. Olave, Mile End New Town, Tower Hamlets, Middlesex, England. Tower Hamlets is in the east of the city and north of the Thames and Mile End New Town is an area within the borough of Tower Hamlets. Mary Heysham, parents unknown though John is a good guess, was christened on 29 March 1767 at Saint Savious, Southwark, Surrey, England. Daniel Heysham, the son of Daniel and Elizabeth, was born on 19 May 1806 and baptized on 25 December 1806 at St. Saviour, Southwark, Surrey, England. There was a large Haysom[e] family living in Dorset, the county just to the west, who were probably related. She married John Budden on 8 November 1608 in Ringwood, Hampshire, England. A parish, a town and a hundred. The town of Ringwood lies within Southampton and soutwestern Hampshire, on the border with Dorset to the west, and contains the villages of Bransgore, Burley, Ellingham, Harbridge and Ibsley. It is on the border of the New Forest, on the east bank of the Avon river. She married John Cook in 1683 in Ringwood, Hampshire, England. The following are related through the towns of Gosport and Titchfield, in Hampshire, and by their supposed connections to Thomas Haysham, a solicitor, who was the manager of the Duke of Portland's estate in Titchfield. Since Gosport is so close to the Isle of Wight, there may also be a connection to the Haysham's of that place. See also the Heyshams of Portsmouth and Portsea at the bottom of this section. He was born in 1636 in Newport, Isle of Wight, Hampshire, England. John Haysom married Elisabeth March in about 1660 in Newport, Hampshire, England. Newport, Gatcombe, and Calbourne are towns and villages on the Isle of Wight, which is located just off the southern coast of Hampshire. Newport, the largest town, is at the center of the island. Gatcombe is just south, on the Down, and Calbourne is to its west, near the Brighstone Forest. (18) John Haysom (1636) ?? Will of Robert Haysham, Mariner of Newport in the Isle of Wight, Hampshire, proved 09 September 1732. John Haysham married Jane Bagster on 5 November 1699 in Gatcombe, Isle of Wight, Hampshire, England. Gatcombe is just south of Newport. If John was the father of Thomas Haysham, below, then he moved from the Isle of Wight, living in Romsey, Hampshire circa 1705. The following was found by Jeremy Greenwood while researching the Cort family. This indicates that John may have been a goldsmith. Note that the Hayshams of Somerset also included a goldsmith. Could this be the (19) John Haysham (c1670), goldsmith, who was living in Bruton, Somerset in 1691? He was the son of John Haysham, Sr., who was a minor government official in Dorset and, later, in Bridgwater, Somerset. A fellow researcher, Jeremy Greenwood, has provided some interesting leads for this family. The following reference, though I can't be certain it is for our Thomas, is at the right time and in the right place. Romsey is upriver from Gosport, just past Southampton. This would imply that by 1705 that John had moved from the Isle of Wight to Romsey, but that by 1714 he was back on the island. Or maybe John simply moved his wife to the mainland for the birth as a safety precaution. See also The Haysham-Cort Family, copied with approval by the original author by Hans Weebers. Thomas Haysham was a solicitor. Many sources spell his surname as Heysham, but another researcher, looking at original sources, says Thomas consistently used the Haysham spelling. Thomas was also said to be of Staffordshire, but that cannot be proved. "The name is spelt "Heysham" by some sources. But in all the documents I've seen, Thomas and all members of his family spell it "Haysham". Some sources say Thomas hails from Staffordshire, but no confirmation has been found." - from "Henry Cort's Second Wife"
I think the reference to Staffordshire may be a confusion with Thomas Heysham [or Hessam], of Butterton, Staffordshire. He had a will probated in London in 1565. He can be found on the Heyshams of the Midlands page. Thomas Haysham was steward for some or all of the Hampshire estates of the Duke of Portland, probably including the Titchfield estate before its sale to the Delm� family in 1741. A lucrative post. Based on the records of his burial and his children's baptism's, he lived in Gosport, Hampshire. Titchfield is about 4 miles northwest of Gosport. Thomas also kept a London address. Gosport, like Portsea is on the western side of Portsmouth harbor. I suspect, based on the Haysham spelling and the proximity to Somerset county, that Thomas as a descendent of the Hayshams of Bridgwater, Somerset. They were styled gentlemen and held government posts in the Customs House. Thomas married Anne Attwick, the daughter of John Attwick and Rebecca Mount - from Jeremy Greenwood. Anne was christened on 14 February 1709 at the High Street Independent church, in Gosport. Thomas' daughter, Elizabeth, was called the niece of William Attwick, who was Anne's half-brother. He was born in Chalton, Portsmouth in 1616. He married Unknown. He married Elinor Lodger on 4 June 1674 in Chalton, Portsmouth. He died in 1686. John Atweeke was christened on 9 June 1675 in Chalton, Portsmouth, Hampshire, of John and Ellinor Atweeke. He moved to Gosport early in the 18th century. From 1722 the Attwick [Atweek] family of Gosport were under contract to supply considerable amounts of nails and other ironmongery to the Navy. John Attwick was a respected inhabitant of Gosport having lived there since at least 1710 when he was chosen as aletaster. Three times he was appointed bailiff to the Manor of Gosport, entrusting him with the collection of the Lord's rents. His houses, at 62 to 65 Middle (or High) Street originally had gardens stretching to The Green and these gardens provided the site for a warehouse, smith's shop and, much later, the Gosport Iron Foundry. In 1718 John was in trouble for leaving timber lying on 'the Lord's waste' as The Green was then known. By 1736, as the ironmongery contracts continued, John had acquired the status of an esquire. For a few years before his death in 1745 he held the contracts jointly with his wife Mary. She continued alone until joined by her son William when he came of age in 1751. The son of John and Mary Atwick, he was christened on 30 March 1730 at the Holy Trinity church, Gosport, Hampshire. John Sr's heir was still a minor when he inherited the business and property in Middle Street and on The Green. Later he too served as town bailiff four times between 1755 and 1770 and was one of the original Gosport Paving Trustees appointed in 1763. By 1760 the contract was in William's own name and he was supplying, amongst other iron goods, nails, hinges, locks, hooks, chisels, axes, hammers, files, ladles, shovels, tongs and forks to the dockyard. In 1768-9 he supplied �7,000 worth of iron goods weighing around 200 tons. William died circa 1774 and his brother-in-law, Henry Cort, inherited the works. A "Mr. Haysham, attorney of Gosport," was the court holder for William Henry Cavendish Bentinck, the 3rd Duke of Portland, as well as the steward of his estate at Botley - from "Catalogue of Papers of William Henry Cavendish Bentinck (1738-1809), 3rd Duke of Portland." [George Gill Mounsey, husband of Isabella Heysham, was the Duke of Portland's attorney in the 1800's]. I suspect that a "court holder," in this situation, was the man designated to hold the manor court in place of the lord of the manor. Or, as is inferred in the next paragraph, the one who keeps the record of the court. Botley is northwest of Portsmouth. Thomas Heysham was "the steward of the Duke of Portland moiety of the Earl of Southampton's Titchfield estates, Hampshire, from 1731 to 1765 [sic, the Duke of Portland sold the Titchfield estate in 1741, Thomas Haysham died in 1762] when the Duke sold this estate." In 1759 the Duke's agent instructed "that the court book be sent so that Mr Haysham can update it." - from "Letter from Clement Walcot, Titchfield, Hampshire to John Powell; 16 Dec. 1759." Walcott was an agent for the Duke of Portland in Hampshire. William Bentinck, the 2nd Duke of Portland, was born on 1 March 1709, the son of Henry. He died on 1 May 1762. William Henry Cavendish Bentinck, the 3rd Duke of Portland, Marquess Of Titchfield, Viscount Woodstock, Baron Of Cirencester, was born on 14 April 1738 Bulstrode, Buckinghamshire, England. He was the eldest son of William Bentinck, 2nd Duke of Portland, whom he succeeded in 1762. He entered Parliament in 1761. He was British prime minister from 2 April to 19 December 1783 and from 31 March 1807, to 4 October 1809. On both occasions he was the nominal head of a government controlled by stronger political leaders. He died on 30 October 1809 in Bulstrode. This estate passed to the 1st Duke of Portland by his marriage to Elizabeth Wriothesley, the daughter and heir of the Earl of Southampton. It was located in Hampshire, near Fareham. The estate was sold by the 3rd Duke of Portland at the end of the 18th century. Botley manor also passed to the Duke of Portland via his marriage with Elizabeth. It was in Hampshire, about 10 miles north of Titchfield. A 13th century Premonstratensian abbey converted into a "right statlie mansion." It was largely demolished in the 18th century, though the three-storied Tudor gatehouse, formed from the nave, remains. Henry VI was married in the abbey, to Margaret of Anjou, and Charles I had his final night of freedom there. I also have a reference to a "Thos Haysham of Gosport in Southton [Southampton] Attorney" who took John, son of Christian Cummins of Portsmouth, as an apprentice on 18 July 1744. Thomas, the son of Thomas and Ann Haysham. He was christened on 13 September 1735 at Holy Trinity, Gosport, Hampshire. He may have died young since he wasn't mentioned in his mother's will. The son of Thomas and Ann Heysham. He was christened on 13 March 1738 at Holy Trinity, Gosport, Hampshire. He may have died young since he wasn't mentioned in his mother's will. Ann, the daughter of Thomas and Ann Haysham, was baptized on 13 April 1737 at Holy Trinity, Gosport, Hampshire. The sister of Elizabeth and co-heir of the estate of their uncle, Jeremiah Attwick, ship's purser, via their mother, Ann Attwick Heysham. Anne Haysham, the daughter of Thomas Haysham and Ann Attwick, married Commander John Becher on 26 September 1761 at Hagley, Stourbridge, Worchestershire. John was baptized on 27 July 1737 at St. Stephens, Bristol, Gloucestershire, the son of the Reverend Henry Becher and Mary Matthews. They had seven children, including John Harmon Becher. Henry Cort, Elizabeth's husband, was prize agent for John Becher. See also Commander John Becher. This family originally came from county Cork, in Ireland. Its most illustrious member was probably Edward Becher, Alderman & Lord Mayor of London, Knight, & Head of the Draper's Company; a compatriot of Robert Heysham, MP, though I don't know how closely he was related to the family below. Of Cork, Ireland. He married Elizabeth Turner. He left Ireland and settled his family in Bristol, England, but returned to Ireland with King William III in 1690 and fought at the Battle of the Boyne. Of Cork and Bristol. While all of his brothers went to Trinity College, Dublin, he was apprenticed to John Duddlestone, a bodice maker and merchant, and married his daughter, Hester. Merchant, Alderman and Mayor of Bristol, an extremely wealthy trading port of the 17th and 18th centuries. Of Bristol. He received his MA from St. John's College, Oxford in 1728. He married Mary Matthews. Sir Edward Becher, Lord Mayor of London in 1727, was a relative and made his "nephew," Henry, his Chaplain and provided him with two livings. Later appointed domestic chaplain to Frederick, the Prince of Wales. Burke's Irish Family records makes the claim that Henry was a Chaplain to King George II. "Jack" was baptized on 27 July 1737 at St. Stephens, Bristol, Gloucestershire, the son of the Reverend Henry Becher and Mary Matthews. He became a Bristol Burgess by right of this father in 1764. John made his career in the Royal Navy. He was an able seaman on FOWEY, and promoted to midshipman in 1753. He sailed with his elder brother, Michael, on JASON, a 44-gun frigate, in 1754. John made Lieutenant on 21 January 1757, and Commander on 1 February 1778 - from ThePeerage.com. He was aboard HMS AMBUSCADE, a 40-gun frigate captured from the French, circa 1758-1761. He married Anne Haysham. on 26 September 1761 at Hagley, Stourbridge, Worchestershire. John remained on the beach, on half-pay, until the American rebellion brought him a ship. Starting in 1776 John served onboard ST ALBANS (64-gun), EAGLE (Admiral Howe's flagship - note that she was famously attacked during the Revolution by the TURTLE, an American submersible), and ARIEL, 20-gun sloop, as acting Captain in 1778. Made Commander in 1778. Captain of CAMILLA, 20-gun, and NAUTILus, 16-gun, between 1778 and 1779. Four of John's five sons were listed in ships' books between 1776 and 1783. In 1779 Captain Becher was taken sick and superceded in command. See Commander John Becher & Ann Haysham. As a young man he served onboard the DAPHNE, circa 1776, as a young gentleman. He joined his father onboard NAUTILUS in 1778 and also served on the frigate ROEBUCK before returning home. He must have had a short stay in England, because in 1779 he was in India, serving with the East India Company. He married Harriet Cowper. She was born on 13 October 1792 in Kilshenaghur, India. She and her mother returned to England in 1795 onboard the MANSHIP. They settled with her grandmother, Anne Haysham Becher, at Fareham, Hampshire. To thwart a bad-match with an Army Lieutenant, Anne was sent back to India on the EARL HOWE in 1809. In India Anne met and married Richmond Thacheray in 1810. Anne had one child with Richmond, who then died, leaving Anne free to marry her Army Lieutenant. He was born on 18 July 1811. The author of "Vanity Fair." John died on 7 November 1783 at the age of 46. Ann died at the age of 88. Mary, the daughter of Thomas and Ann Haysham, was baptized on 1 February 1739 at Holy Trinity, Gosport, Hampshire. Thomas, the son of Thomas and Ann Haysham, was baptized on 21 February 1741 at Holy Trinity, Gosport, Hampshire. Elizabeth, the daughter of Thomas and Ann Haysham, was baptized on 16 January 1744 at Holy Trinity, Gosport, Hampshire. Of Gosport, Hampshire. This is a seaport and major naval and military center on the western side of Portsmouth Harbour. She was the niece of William Attwick, the son of John and Mary Attwick of Gosport. Elizabeth's uncle was Jeremiah Attwick, a ship's purser. His sisters, Elizabeth and Ann, inherited his estate upon his death. When they both died in 1766 most of their estates were left to Ann's daughters, Elizabeth, Anne and Hannah. Elizabeth won adminstration of the estates. John Becher, Elizabeth's brother-in-law, had for an agent Henry Cort, who had handled many similar estate documents. The two probably met when Elizabeth sought advice on the will. On 16 March 1768 Elizabeth married Henry Cort, as recorded in the register of St. Thomas the Apostle church, London. Elizabeth was "of London" meaning that when her father died in 1762 she and her mother probably resettled in that city. Crutched Friars is a street near Tower Hill, named for an order of mendicant friars, "Fratres Cruciferi", who came to England in the 13th century. "the niece of Mr. Attwick . . . the daughter of a solicitor in Staffordshire, who was steward to the Duke of Portland. There is a hint that Cort received some fortune with his wife. The memorandum goes on to state that Mr. Attwick "had a contract for supplying Portsmouth Dock Yard with mooring chains and other Iron Naval store." - from "Transactions By Newcomen Society"
The fact that Henry thus knew that Elizabeth was inheriting a �3000 estate may have colored his marital decision. This was Henry's second marriage. He had previously been married, for only a short time, to an Elizabeth Brown. Henry was born in Lancaster in 1740, the son of a builder and brickmaker. In 1765, at the age of 25, he had begun his career as a Naval Agent in London. The Naval Agent acted on behalf of naval officers and sailors to recover prize money and back pay from the Navy Board, and took a percentage commission for his efforts. In this position he became aware of the poor quality of British iron compared to that which was available abroad. Henry inherited the Funtley ironworks, near Fareham in Hampshire, upon the death of William Attwick in 1774 and in 1775 he gave up his job as agent for the Navy to set up his own business. I wonder to what extent Henry's interest in ironworking preceded or followed his introduction to Elizabeth and the Attwicks? By 1777 Henry, Elizabeth and their five children (eventually rising to thirteen) had moved to Gosport and Henry joined the Attwick family iron businees. They settled at 62 Middle Street. As his work expanded he needed capital and in 1781 he took Samuel Jellicoe as a partner. His father, Adam Jellicoe, Deputy Paymaster of the Navy, provided financial backing in exchange for patent rights. Henry began experimenting on and improving the manufacture of English iron. Between 1783 and 1784 he took out patents for the processes he had developed. One patent process involved the production of bar iron by hammering at a constant temperature and rolling out all the impurities. This produced iron that had been compressed into a tough and fibrous state. The second patent involved the manufacture of bar iron from ore or cast iron in an air furnace without a blast. During this process the liquid iron was constantly stirred with iron bars, called "puddling," burning off the carbon from the cast iron and the iron was separated from the slag. This was then hammered and rolled as above. By 1820 there were at least 8,200 of Cort's furnaces operating in Great Britain. Cort, however, never benefitted financially from his work. His partnership ended in financial disaster. When Adam Jellicoe died it turned out that he had illegally used Naval funding to invest in Cort's ironworks. The government seized much of his property, including Cort's patents, to pay off his debt. Cort never recovered and he left his iron works in 1789. Samuel Jellicoe, on the other hand, did, having inherited the Gosport and Fontley foundaries. His descendent was Admiral Jellicoe of WWI naval fame. In 1791 Henry Cort was given a pension of �200 a year. He died in London 23 May 1800 and was buried in Hampstead. His widow, Elizabeth, was left destitute with 10 surviving children to support. Eventually, in 1801, the Treasurer of the Navy, Henry Dundas, Viscount Melville, authorized a grant of �100 per year. Elizabeth died in 1826. (22) Henry Bell Cort (1769), he went to India and became an indigo planter; this failed. He married Frances Burges and moved to Guiana in 1805, where he died in 1806. (22) Coningsby Francis Cort (1770), known as Con, he also went to India, though apparently stayed only a short while. He married Ann and had a son, Henry Hannam Cort. Henry Hannam Cort was an Apothecary of Ripley, Surrey. He may have married Sarah Eugnenia Axcell. (22) William Thomas Cort (1771), he married Mary Ann. He moved to Berbice. (22) Richard Cort (1784), he married Mary Caroline Kendall. He was a partner of W Kirkpatrick in Bread Street, Cheapside: "Merchants, Warehousemen, Dealers and Chapmen"
I also have a John Haysham Cort, Obituary, 1853. "June 2. In Judd-st. John Haysham [sic] Cort, esq. of the Bank of England." - from "The Gentleman's Magazine." He must have been a grandson. John was also mentioned in a suit of 1837 which looks to be a family feud. "Cort v Wilson. Bill and three answers. Plaintiffs: William Cort and others. Defendants: John Wilson, Henry Hannam Cort, John William James Dawson and wife, John Haysham Cort, Caroline Cort, Louisa Cort, Louisa Powell, Eliza Powell, Henry Liddon, Frederick Liddon, Eliza Cort, William Cort, Mary Macdonald, Frederick Cort, John Cort, Duncan Fraser and wife and Charlotte Cort (abroad)." Note that Henry Hannam Cort was the son of (22) Coningsby Francis Cort (1770). Louisa and Eliza Powell were the children of (22) Louisa Cort (1786). A possible sister to Thomas Heysham based on the Titchfield connection of her marriage, and the Ward connection to a descendent of Henry Cort, cited below. John Ward, Esq., b. in 1735, son and heir, m. Elizabeth Young, and d. in 1787, leaving issue," - from "A Genealogical and Heraldic Dictionary of the Landed Gentry." Could Elizabeth be related to the Titchfield Heyshams who married into the Cort family in 1768? Thomas Haysham the Duke of Portland's manager of his Titchfield estates, would in this scenario be her brother and used his influence to introduce her to John Ward. Crabborn is just five miles from Gosport. I. John, of whose line we treat. II. James . . ."
The Battle of Malplaquet, fought on 11 September 1709, was one of the bloodiest battles of the War of the Spanish Succession, which opposed the Bourbons of France and Spain against an alliance whose major members were the Habsburg Monarchy, the United Kingdom of Great Britain and the United Provinces of the Netherlands. The Allies were led by John Churchill, the Duke of Marlborough, and Prince Eugene of Savoy. "Do we find one of these descendants in 1799, when Henry Bell Cort, eldest son of Henry and Elizabeth, is confined to a mental hospital in Calcutta? He is visited by one Rev Dr James Ward, who claims to be a distant relation. James turns out to be the son of "John Ward, of Newport, Hants" (i.e. Isle of Wight), who seems to have held the post of Deputy Comptroller at the Custom House in nearby Cowes, and could easily have been born in 1735." - from Henry Cort's Second Wife. A possible brother to Thomas Haysham. He resided in Portsea, Hampshire circa 1731. John, the son of Gabriel Haysham, was baptized on 29 July 1731 at Saint Marys, Portsea, Hampshire. A possible brother to Thomas Haysham. Of Gosport. He married Elisabeth. "Haysham, George, of Portsea, gent., b[achelor]., & Elizabeth Morss, of Alverstoke, sp[inster]., at A., 6 Feb., 1735." - from "Hampshire Allegations for Marriage Licences"
Portsea is just across the bay from Gosport. This fits plus I like the fact that he's a gent., which makes him a better fit with his supposed brother, the lawyer Thomas Haysham (c1708). The daughter of George and Ann Heysham. Ann was christened on 8 April 1737 at Holy Trinity church, Gosport, Hampshire. This would assume that George married twice. "Haysom, Richard, of Calbourne [Isle of Wight], & Ann Saunders, of the s. [same], 09 Sep 1772." - from Hampshire: - Marriage License allegations, Bishop of Winchester, 1689-1837. James, the son of James and Mary Haysom, was baptized on 1 December 1799 in Newport, Isle of Wight, Hampshire. Frederick, the son of James and Mary Haysom, was baptized on 1 February 1805 at St. Mary, Cowes, Isle of Wight, Hampshire. Of Gosport. He marred Elizabeth. He may have later married Anna. The daughter of Edward and Elizabeth Heysom. She was christened on 14 July 1797 at Holy Trinity church, Gosport, Hampshire. The son of Edward and Anna Heesom. He was christened on 03 March 1805 at Holy Trinity, Gosport, Hampshire. The son of Edward and Anna Heesom. He was christened on 30 August 1806 at Holy Trinity, Gosport, Hampshire. The daugther of Edward and Anna Heesom. She was christened on 30 August 1806 at Holy Trinity, Gosport, Hampshire. The son of Robert and Hannah. He was christened on 27 April 1804 at Holy Trintiy church, Gosport, Hampshire. "Haysom, John, of H.M.S. Le Juste, mariner, 21, b. [bachelor], & Margaret Connor, of Portsmouth, 21, sp. [spinster], at Portsea, 03 May 1800." - from Hampshire: - Marriage License allegations, Bishop of Winchester, 1689-1837. As a mariner, of course, John may have been born almost anywhere. A French ship of the line, of 80-guns [84? ], built in 1795. She was captured by the English in the battle known as the "Glorious 1st of June," in 1794. 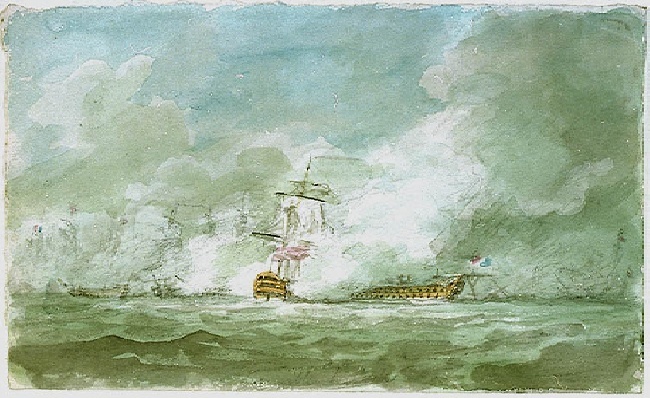 At right is a watercolor by Nicholas Pocock of the engagement between Le Juste and HMS Invincible off Ushant on 1 June 1794. In 1800 she was commanded by Sir Henry Trollope, a notably aggressive captain, and served as part of the channel fleet, blockading France and protecting England from invasion by Napoleon. She was paid-off in 1803. William Moquist of H.M.S. SCEPTRE, a seaman, a bachelor aged 21, married Janny Hysom, of Portsmouth, aged 21, spinster, at Portsea, on 20 May 1805. Portsea is a small town on the eastern side of Portsmouth harbor, now part of the Portsmouth city metropolitan area. Portsea is also the name of the low-lying island on which most of the city Portsmouth is built. A small channel, Port creek, separates the island from the mainland. The Isle of Wight is just to the southwest. Henry Pike, the son of Robert and Margaret Haysham, was baptized on 18 September 1774 in Swanage, Dorset. I've also seen a record of the baptism that called him Henry Pyke Haysom. The forebear of the Drake-Hysham line in America. He moved to Portsea, Hampshire between 1800 and 1803. William may be [?] a son or cousin of Henry Pike Haysom, though Ann Fisk, a descendent, says no. His full name may be William Henry [after his father?] Haysom. William Haysom married Mary Rood on 10 September 1821 at St. Marys Church in Portsea, Hampshire. He was a stone mason / statuary. This is a strong indicator of his attachment to the Swanage line, who were stone masons. He moved to London circa 1830, where there would have been much work in the rapidly growing city. In the 1841 census of Kennington Second, Lambeth borough, St. Mary parish, Surrey as William Haysom, a 45 year old stonemason. Living with him were his wife, Mary, 40, and children, Ann, 15, William, 14, Emma, 10, George, 7, Rebecca, 5, Jane, 3, and Louisa, 1. (24) George William Haysom born 1834 married Charlotte Thrift. Could the following be our George William? In the 1871 census of Shoreditch, Hoxton ward, Hackney borough, London as George Haysom, a 28 year old railway clerk, of East Woodhay, Hampshire. Living with him were his wife, Harriet, 27, of Barnham [? ], Norfolk, and children Charles Earnest, 1 month, of Hoxton. In the 1881 census of South Hackney, Hackney ward, London as George Haysom, a 38 year old boot maker, born in East Woodley, Hampshire [?]. Living with him were his wife, Harriet, 42, of Barnham, Suffolk [! ], and children Charles E., 10, a scholar, George M., 7, Maud F., 5, and Sidney H., 2, of Shoreditch. In the 1891 census of Hornsey parish, Middlesex as George Haysom, a 47 year old stone mason, born in Hoxton, London. The age and place of birth are right, but how did he get knighted? Living with him were his wife, Eliza, 43, of Camb's [? ], and children, George, a 22 year old "HMS Navy" man born in London, Nellie, 10, of Islington, Walter, 6, of Islington, and Lousia, 3, of Hornsey. (24) Rebecca Haysom born in 1835. I have a Rebecca Haysom, born c1835, in London, the daughter of William Henry Haysom, a packer. She married James George Milton in Stepney on 25 December 1859. She was a cordwainer living at 27 Erith [?] street. (24) Robert Haysom born c1836 died 1882 New Zealand; ? not in 1841 census. (24) Susan Louisa Haysom born 1840. William and his family lived at South Island Place in Brixton. Information per Ann Fisk. Who was Sir George Haysom? I don't know where Sir George fits in this lineage. He was born in the Shoreditch area, on 6 May 1862, the son of George Haysom and Emma, the daughter of George Ringrose - from Dod's Peerage. He first married Lydia, the daughter of Samuel Archer, in Bethal Green on 27 February 1881. She died in West Ham in 1899. Second he married Edith Mary, the daughter of Frederick Gaunt, of Downham Market, and widow of W.H. Marshall on 2 February 1904. George Haysom lived at 109 Fenchurch street, in London, a Deputy and member of the Common Council for Aldgate, in 1908. "London: City. - At a dinner of the Library Committee of the City Corporation, held on March 30th, in the art gallery of the Guildhall, the chairman, Mr. George Haysom, stated that the Guildhall Library contained 135,000 volumes and pamphlets, and nearly 6,000 manuscripts, most of them of great value." - from "Library World." The following is a description of an invitation card to a banquet. "Author : [City of London] Ornate Invitation Card Title : Banquet at the Guildhall , 1916 Description : [City of London] Ornamental Invitation Card (1916). Invitation to the Banquet at the Guildhall on Thursday November 9th, 1916, Colonel The Right Honorable Sir William Henry Dunn, Kt., Lord Mayor, Major Louis Arthur Newton, C.C., and George Haysom, Esq., C.C., Sheriffs." In 1916 Sir George Haysom and Major Lewis Arthur Newton were selected as Sheriffs of the city of London. 1922-1925 Phone Directory. "Lindfield 62. Sir George C. C. Haysom. The Welkin" Lindfield is in West Sussex, north of Brighton. -George [Samuel], Florence [Maude], [Lydia] Ethel, Beatrice [May] and Constance [Muriel]. Constance was the youngest,born in 1895. She was my mother. I have correspondence between him and the Mansfield family concerning the Haysoms of Ringwood. The following describes the war weariness amongst the uppler classes during World War I. "The papers today are full of Peace proposals by Germany but I don't think much of them although I am of (the) opinion that we are all sick of the War." That someone as 'respectable' and 'ordinary' as George Haysom, should have these thoughts was significant. He would have been in considerable trouble if his views had become known." - from "Losing the Plot" by John Jackson. Sir George died on 9 July 1924. George Samuel Haysom, of 1 and 3 Creechurch Lane, Leadenhall Street, London, E.C., naval outfitter." - from The Edinburgh Gazette of 9 October 1925. The son of Henry and Sarah Haysom. He was christened on 17 March 1801 in St. Mary's church, Portsea, Hamphshire. The son of Henry and Hannah Haysom. He was christened on 5 August 1804 in St. Mary's church, Portsea, Hamphshire. He was born on 8 June 1806 in Portsea, St. Mary's church, Hampshire, England. He emigrated to America, probably around 1830, and settled in Kentucky. See the Drake-Hysham Line page for the story of his family. My name is John Haysom. I was born in Portsmouth UK in 1938. I read your family tree research with interest. My Grandfather George, was born in Portsea in 1884 and his father, also George was born there in 1853. That's as far back as I can go. Can you help? Looking forward to hearing fromm you. Here's what I have after some checking back with John. (21) Robert Haysham (c1740) (22) Henry Pike Haysham (1774) (23) Henry Haysom (1804) ?? Perhaps the son, or grandson, of (22) Henry Pike Haysham (1774), who was born in Swanage and moved to Portsea around 1800. Interestingly, in Dorset his name was spelled Haysham, but in Portsea it was Haysom. Was this simply the clerk using the "usual" spelling? One of Henry Pike's sons, George Howard, emigrated to America, but he had two others, William (1800) and Henry (1804). William moved to London around 1830, so he's probably out. Henry, I know nothing about. A cabinet maker, born in Portsea. In the census of 1881 [this was the only family of this name or anything like it, that were living in Portsea at this time] he was 27 years old, living at No. 45 Havant street, Portsea. His wife was Louisa, age 24, from Ryde, Isle of Wight, Hampshire. John Haysom remembers his grandfather, George Jr., thinking his mother was born in 1853 and resided in St. Georges Square, Portsea. He said her maiden name was Louisa Jane Morey. He said his father was from Britain Street, Portsea, which is just around the corner from St. Georges Sq. Their children were Georgina, 3, and Lilian A., 8 months. Three years later a son, George, was born. The son of George. He was born on 16 June 1884 in Portsea Island, Hampshire. He married Blanch Gertrude French in about 1910. She was born on 9 January 1884 in Portsea. George died in 1981 in Portsmouth, Hampshire. Sheriff of London, 1916. George Haysom, CC, lived on Fenchurch street in London in 1908. I don't know where these fit, but here will be good for now. Author : [City of London] Ornate Invitation Card Title : Banquet at the Guildhall , 1916 Description : [City of London] Ornamental Invitation Card (1916). Invitation to the Banquet at the Guildhall on Thursday November 9th, 1916, Colonel The Right Honorable Sir William Henry Dunn, Kt., Lord Mayor, Major Louis Arthur Newton, C.C. and George Haysom, Esq., C.C., Sheriffs. "London: City. - At a dinner of the Library Committee of the City Corporation, held on March 30th, in the art gallery of the Guildhall, the chairman, Mr. George Haysom, stated that the Guildhall Library contained 135,000 volumes and pamphlets, and nearly 6,000 manuscripts, most of them of great value." - from "Library World"
William Haysom, the son of William and Elizabeth Haysom, on 3 Jun3 1810 in Southampton, Hampshire. In 1841 William's children were Eliza, 7, William, 5, and George, 3. George Haysom, the son of Martin and Mary Haysom, was born on 15 September 1839 in Southampton, Hampshire, but he died and was buried on 20 September 1839. I also have a George Haysom, the son of William and Eliza Haysom, who was born on 22 October 1837 in Southampton. George Haysom [which one?] died in 1901 in South Stoneham, Hampshire. The other one died in 1905 in Dulverton, Somerset. Albert W. Haysom, the son of George and Sarah J. Haysom. was born in 1866 in Bitterne, Hampshire. He married Edith Mary Withers in 1889 in Romsey, Hampshire. He died at the age of 34 in 1900 in South Stoneham, Hampshire. Cyril George Haysom, the son of Albert William and Edith Mary [Withers] Haysom, was born in Southampton [South Stoneham], Hampshire on 29 April 1892. He had a sister, Maud [Jack Benefiel]. In the 1901 census of Romsey, Hampshire as Cyril G. Haysom, 9, living with his mother, Edith M., 37, and siblings, Edith M. [Maud], 7, Arthur W., 5, Mildred E., 3, and Lillian M., 2. 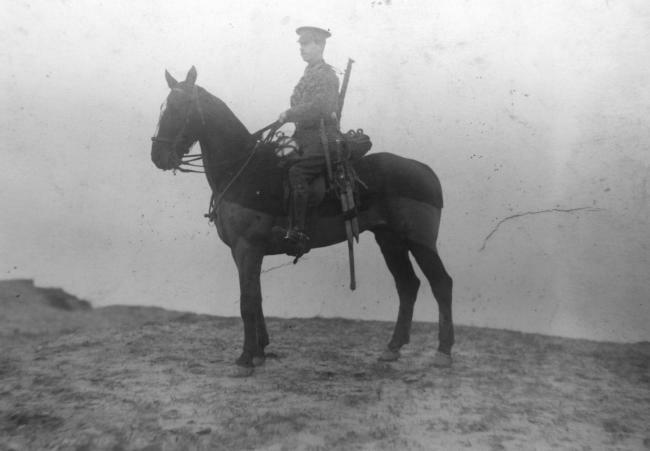 "Haysom, Cyril George Derbyshire Imperial Yeomanry" was "wounded, and recovered" in World War I. Associated with Arthur William Haysom. Both of Romsey. 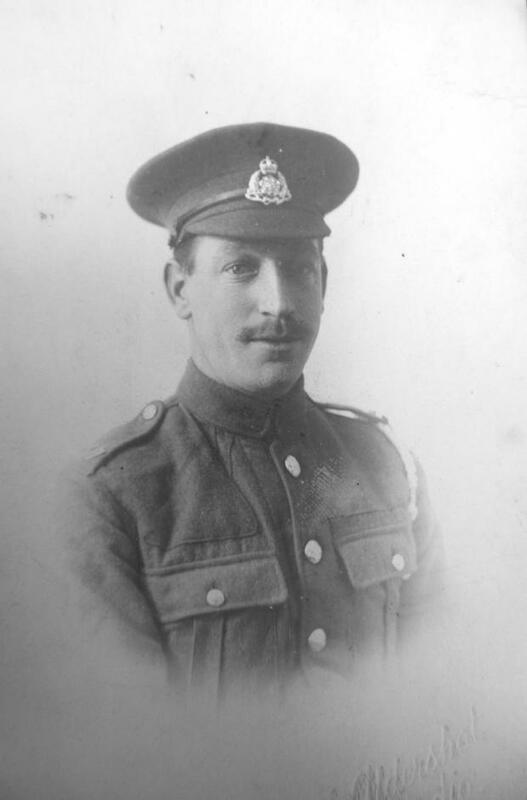 Cyril Haysom enlisted in 1914 was a mounted soldier who served throughout the Great War, surviving the Gallipoli campaign in Turkey , where the regiment fought on foot, and eventually becoming part of the army of occupation in Germany in 1919. There was a George Haysom, age 44, who worked at [or was in] the Kew Lunatic Asylum in 1861. He was born on 14 June 1912 in Portsmouth; mother's maiden name French. Cyril G. Haysom married Mabel Florence Batt in 1936 in Portsmouth. Cyril served in World War II. Cyril died in 1977 in Chorleywood. The grandson of George Jr.; mother's maiden name Batt. She was born in 1914; mother's maiden name French. Peggy V.E. Haysom married Robert Keeling in 1934 in Portsmouth. Some 25 years ago, when we were visiting Langton Maltravers in Dorset we spoke to a Walter Haysom - a marvellous old man who was a retired stonemason (we also met his son Trevor, who still operated the quarry). He incidentally was responsible for much of the restoration of the Temple Church in London. By coincidence, he was an amateur geneologist and had a mind-boggling library, which went back to the Rolls of King Henry. Anyway he seemed to think that my branch of the family descended from one of five or six brothers who lived in the Swanage area [probably right]. That one had travelled across the water to Portsea (presumably). And that's about all I know. Walter Haysom sent us to the Dorchester Records Office or Library (I can't remember which). It was there that we uncovered an amazing family tree, researched and produced by a Robert Mansfield Haysom. It began with "John Haysom of Wooland and Ibberton, Co. Dorset. Custodian of the Church Plate 1552 ". It included Sir William Rose Mansfield, GCB, GCSI, DCL, Ist. Lord Sandhurst and later Lady Victoria Alexandrina Spencer, daughter of the 4th. Earl Spencer, marr. 1881. She died 1906. (The current Lord Spencer is of course Princess Diana's brother.). It appears that there were quite a number of Haysoms living in Ringwood, Hampshire in the 17-1800s. I was unable to establish any link between ourselves and this family tree - which is a pity because we might well be related to the future King of England! Well Steve, that's about that! If you are able to find out anything more about our tree, I would really like to hear from you. The following is a list of men who were rich enough to pay taxes in Sussex. The first name listed, John Bac [later Bax], was given prominence, assumably because he was the head man in the village. Villate de Brystelmstone et Molscumbe. De Johe. Bac . . . 3s 1 1/2d. The following is quite anomolous. A Johan. Haysham, was Sheriff of Surrey and Sussex, in 1 Henry V , no arms were given. - from "The History of the Worthies of England" by Thomas Fuller and Peter Austin Nuttall. This is very early making Johannes a contemporary of (11) Thomas de Hesham (c1350) of Lancaster who was murdered while in the King's commission. 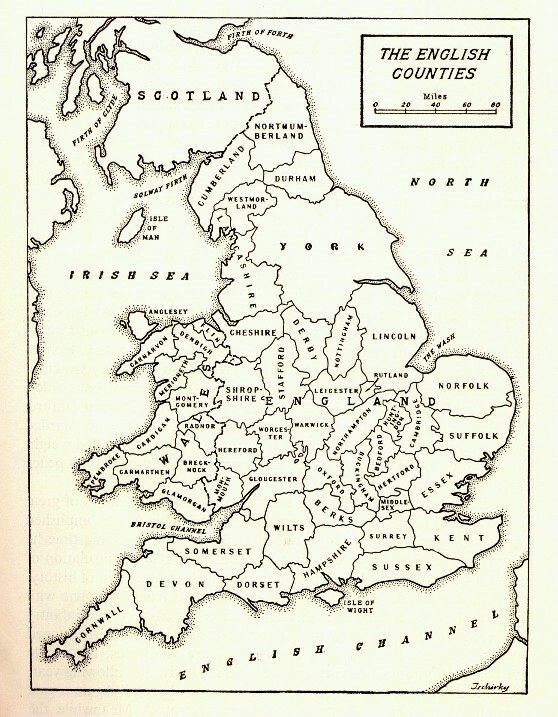 Note that Surrey and Sussex were at a number of times under a single Sheriff. Surrey is just south of London. "Heisham / or Hysham / Sir William / Chilham / 1519 PRC3/4/126" - from "Calendar of Wills and Administrations 1396-1558," Source: Original Volume by Henry R. Plomer Pub.1920, Canterbury Cathedral Library. Chilham is in Kent, 5 miles southwest of Canterbury. James Hasham married Elizbeth Kedlesden on 12 October 1567 in Cranbrook, Kent, England. James Hasham married Mary See on 11 September 1679 at St. John, Margate, Kent, England. Maidstone, Kent, England Freeman�s Index (Freeman = Apprentice who had served his time and was freed). Giles Hysham, the apprentice of Hy and Francie Hall completed his indenture and freed in 1754. "Jan 1993 Heesom, Edward Nicholas, Salmans Manor, Penshurst, Kent TN11 8DX. (Heesom)" - from "List of Fellows of the Huguenot Society of Great Britain"
1 - Grace Heysham married John Mariet on 18 April 1725 in Hughenden, Buckingham, England. A sister of John? In the 1871 census of Burnham, Farnham Royal, Buckinghamshire, England as Sophia Heesham, the 40 year old daughter of Elizabeth Bolton. Of Farnham Royal. Also living with her were her children, Henry T., 16, and Emily K., 13, both of Middlesex, London. (24) John Haysham (1819) ?? In the 1841 census of Ross, Herefordshire as John Hayhsam, a 22 year old shoemaker, not born in Herefordshire. A Sydney D. Heesom was born in the 3rd Quarter 1916 in Romford, Essex; mother's maiden name was Capsey. "Skilled Workmen." - from "The London Gazette" of 28 February 1941. Sydney was an electrical engineer working in East Africa, in Kenya, Uganda and, maybe, Tanganyika. There is evidence for an early marriage by a Sydney D. Heesom to a Brenda Smith, in Greenwich, in 1946. Apparently this did not last long. "Sydney Denis Heesom, A.M.I.E.E., to be Acting Assistant Engineer, Posts and Telegraphs Department, with effect from 12th July, 1946." - from the "Kenya Gazette." "Heesom.--On July 19th, 1949, at Kampala, Uganda, to Brenda, wife of Sydney Heesom, East Africa High Commission � a daughter (Karen)." - from "Corona: The Journal of His Majesty's Colonial Service" of 1950. He was also in the Colonial Office List of 1951 AMIEE. Sydney D. Heesom, a 33 year old Electrical Engineer from Uganda, accompanied by his wife, Brenda, 28, and child, Karen B., 2, arrived in London from Mombasa, Kenya on 25 October 1949 onboard the LLANGIBBY CASTLE. Sydney D. Heesom lived in London in 1951-2. Sydney D. Heesom, a 37 year old Engineer from the Gold Coast, arrived in Liverpool from Lagos onboard the ACCRA. His residence was listed as Bridle Gate, Horsebridge, Nr. Hailsham, Sussex. ". . . A NI 549 Healey D. Admiralty 66 Heesom SD - Aviation 245 Heesom SW - Trinity House 760 Heffernan Miss JF Med. Res. . ." - from "The British Imperial Calendar and Civil Service List," 1964. Could this be Sydney Denys? A Mason in the Estreham Lodge. Sydney D. Heesom lived in Epsom, Surrey, circa 2002. Possible wife, Diane M. Heesom. A Sidney Heesom lived in Widnes, Cheshire, circa 2002. Family may have included Julie and Patricia J. Heesom.